Martin Parr in conversation with Kate Fox and Sean O’Hagan at the new Media Space, Science Museum, South Kensington. It was a rather interesting evening, Listening to ideas and discussion with these speakers. I went with three former students to the talk, which was held in the IMAX theatre and it was rather interesting to see both Tony Ray-Jones and Mark Parr’s images that large on an IMAX screen while we were watching the slideshow (that was on continual loop). I actually saw things in Tony Ray-Jones’s images that I hadn’t seen before because of the scale of the images being presented via the sideshow. Martin, Kate and Sean were having their conversation below it. Kate Fox is a co-director of the Social Issues Research Centre (SIRC) and was a great foil for Martin Parr while Sean O’Hagan (Guardian photography writer) chaired the evening and kept them on track discussing Englishness, eccentricity, cliches and the occasional photographic quip relating to Martin’s work. 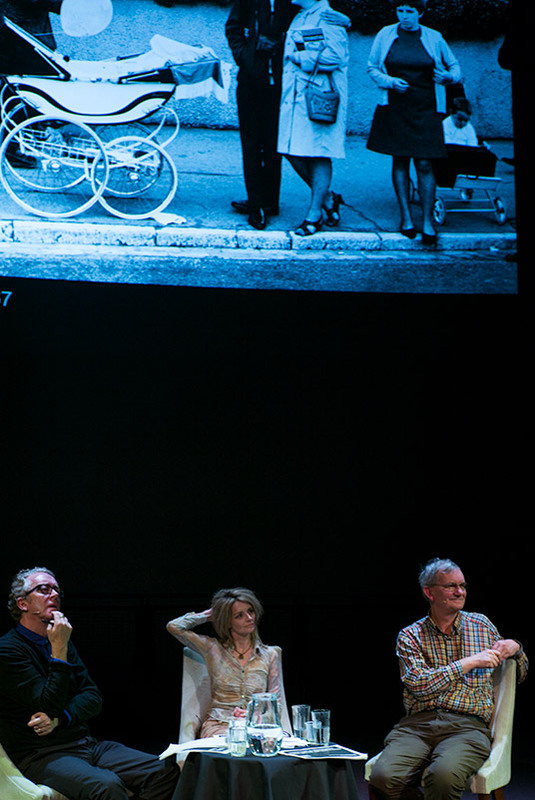 My friends at the end of the talk all brought Martin Parr’s new book the The Non-Conformists, which is all black and white images. I didn’t as I already have three of Martin’s books and I am saving my money for something else. I did however get my copy of “Cost of Living” signed, which means Martin has now signed two of my books of his. Here are some notes that I made from from the conversation. Martin Parr: surprised by how English, the English still are – when he was referring to the work of Tony Ray-Jones and how it is still possible to go and make work that is still terribly English. Martin Parr: No matter how much you are involved in it, you’re still not part of it -in referring to making his work from Hebden Bridge, talking about how embedded they were in the community they were photographing and yet still somehow separate from it as they were photographing the life that they were involved with while they were creating the documentary images of the community that they were observing and yet they were still because of this documentary photography not really a part of that. Martin Parr: Brashness of modern society – comment made in referring to why he prefers colour, in the middle of a discussion about why colour photography was his medium and that it reflects as he said “the brashness of modern society”. Martin Parr: find photographers with their own voice – In referring to what Magnum as an organisation is looking for when they are selecting photographers to be included into the Magnum family. He expressed that as they were looking for photographers who have their own voice that is there is and they can then help them to keep building and maintaining that voice through finding work that is mutually beneficial. At some point during the evening, and I guess this comes up often with regularity in this kind of conversation and talk somebody asked a question about where was the politically engaged photography from this economic crisis. I’m working on it, I have way too many hours teaching and not enough time making images that is my excuse. For now I’m sticking with it, as I’ve been thinking through how to make documentary images that do explore this exact question of it politically engaged photography exploring economic issues. It is something that I was attempting to do through the research that I undertook with Anna Fox and Judith Williamson and it is something that I’m still struggling with at the moment how to represent visually something that is an idea.